This week’s Mobile Mac Weblog theme is sleeves —loosely defined as a compact case designed to hold just a laptop, either for protection when carrying the laptop around by itself, or for throwing the notebook inside a larger bag or a suitcase. (Although some sleeves cheat a bit, giving you room to store a few documents, or even a few small accessories.) On Monday, I wrote about a number of soft sleeves and hard shells that we hadn’t previously had a chance to cover. Today I give you the details on a few rigid cases. I’ll be looking at leather cases on Friday. Soft sleeves are great for avoiding scratches, but if you need something sturdier—to carry your MacBook Pro on its own, or if you’re worried about your MacBook getting bumped or dropped while inside another bag—a sleeve that provides impact protection may be a better option. 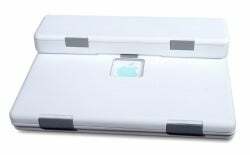 One caveat: unlike soft sleeves and hard shells, which provide some degree of protection without adding much bulk, the extra protection offered by a rigid case comes at a cost to your laptop’s svelte figure. The foam interior of the Hardsleeve provides a 3/4-inch barrier around the edges of your laptop and a thinner cushion on the top and bottom. When inside, your MacBook or 15-inch MacBook Pro (depending on the Hardsleeve model) fits like a glove, moving only a fraction of an inch from side to side. The case’s zippers generally slide easily, although I occasionally had to give them a firm tug. Axio also includes a set of adhesive, rubber feet for the bottom of the case—you can apply these feet to keep the case from sliding around on flat surfaces, or to protect those surfaces from the case itself. The downside to the Hardsleeve’s excellent protection is, as noted above, added bulk; for example, the version for the 15-inch MacBook Pro is nearly 16 inches wide, 11.5 inches deep, and 2 inches thick, and adds nearly two pounds to your load (the MacBook Pro itself is 14.1 by 9.6 by 1.0 inches). But if you need the protection, the bulk may be worth it—the Hardsleeve is the most protective sleeve-style case I’ve seen. The other unique feature of the Hardcase is a clip-on plastic compartment, approximately one-third the size of the case itself, for storing a few accessories, such as your laptop’s AC charger and a few cables. This adds considerable bulk to the case, but it does come in handy when you’re carrying the Hardcase by itself. Although this design means the Portfolio doesn’t provide nearly as much impact protection as the Hardshell, the Portfolio can accommodate quite a bit more gear. Larger than even the bulky Hardshell at 17 by 13 by 2 inches, the Portfolio holds your MacBook Pro and still has enough room for a zippered, nylon pouch to the side for storing a mouse and several cables. There's also a thin document pocket in the case’s lid that can hold a file folder or a couple magazines. Your MacBook pro is secured in the case by a nylon strap that fastens using Velcro. 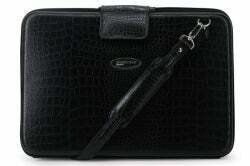 The Portfolio also offers a couple carrying options not found on the Hardshell. 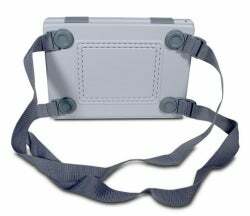 A thin shoulder strap, made of the same faux-crocodile material, attaches to two D-rings on the outside of the case, and you get two unpadded nylon handles that fold into the case when not in use. A four-inch wide flap at the top of the case gives you a Velcro closure for carrying the case—for short distances—without zipping it up. The Portfolio isn’t nearly as protective as Axio’s Hardshell, I personally don’t like the fake-crocodile-skin appearance, and the case is too big to fit in all but the largest of bags. On the other hand, it’s less expensive than the Hardshell and offers a number of convenient carrying and storage options. Two unpadded, nylon handles and a pair of connectors for a shoulder strap (not included) let you carry the Brain Cell on its own. 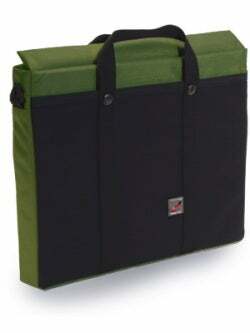 An external document pocket accommodates a couple file folders, magazines, or a book; the pocket is actually somewhat elastic, so you can use it carry your laptop’s AC adapter and a few cables in a pinch. Although not exactly a hardshell case, the Brain Cell protects nearly as well and offers more carrying options; the ability to carry a few small items is a nice bonus when you’re toting the case by itself.